I’ve got one of these eGo-V V3 Mega batteries myself and it’s a well made, sleek, very reliable battery that has both eGo and 510 connection threading so it should work with most herbal attachments coming out these days. 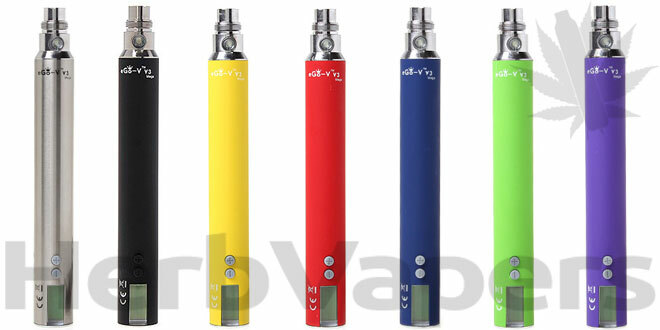 Also, unlike the previous versions, the eGo-V V3 runs either as a variable voltage, or a variable wattage device allowing you to fine tune your herbal vapes. It can even check the atomizer resistance of the attached device! Unlike most of the eGo style batteries available, the eGo-V V3 Mega has a USB charger port on the bottom, so if your battery dies while your vaping some herbs, you can simply plug in and keep on vaping! If you don’t already have a battery but wanted to try all these herbal attachments that are coming out, or maybe you just need a reliable backup in case your favorite battery dies, then the eGo-V V3 Mega battery is perfect for you!